Accademia Filarmonica Romana is the oldest private music society in Rome; the Pope's Government chartered it nearly two centuries ago. I've often commented on its opera performances - see 'Is Carmen for children', 3 May 2018, its Summer open air concerts - see 'A pleasure garden', 6 July 2018 and its chamber opera productions - see 'A short bittersweet opera', 8 March 2018. In short, in various venues, and with little Government support, the Accademia has a varied program throughout the year. On 17 January 2018, the Accademia inaugurated a series of ten chamber music concerts in the elegant downtown Teatro Argentina, praised by Stendhal as the most sophisticated European theatre of his times. I was in the audience. For the series of chamber music concerts, the society invited ensembles of international reputation. 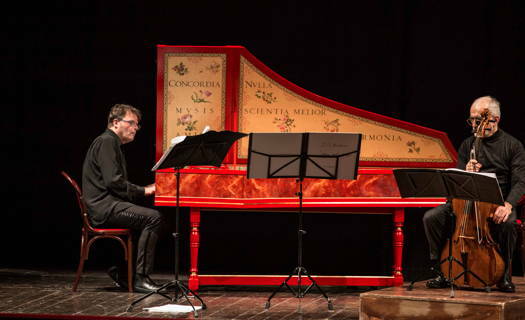 For the inaugural concert, Accademia Bizantina was on stage with period instruments. The program was the integral performance of Johann Sebastian Bach's Die Kunst der Fuge (The Art of Fugue), BWV 1080. Written in the last decade of his life, The Art of Fugue is the culmination of Bach's experimentation with monothematic instrumental works. It was still incomplete at Bach's death, and his impoverished wife sold the score to Leipzig City Council for a comparatively modest sum. The work consists of fourteen fugues and four canons in D minor, each using some variations of a single principal theme, and generally ordered to increase in complexity. 'The governing idea of the work', as put by Bach specialist Christoph Wolff, 'was an exploration in depth of the contrapunctual possibilities inherent in a single musical subject'. In the score, albeit unfinished, the word contrapunctus is often used for each fugue. There are various versions of the score and a number of musicologists' theories on the purpose and nature of the composition, which was left without any indications as to instrumentation. Some think that it was meant for public performances for students to exercise and, may be, to complete. Often, it is performed only on the harpsichord - a well-known recording is that by Menno Van Delft on a 'Brilliant' CD. There are also performances by small, yet symphonic, orchestras. Accademia Bizantina, led by Ottavio Dantone - see 'Eros and Philosophy', 6 August 2016, and 'A Special Place', 1 May 2012 - chose a chamber music version they have recently recorded for Decca. 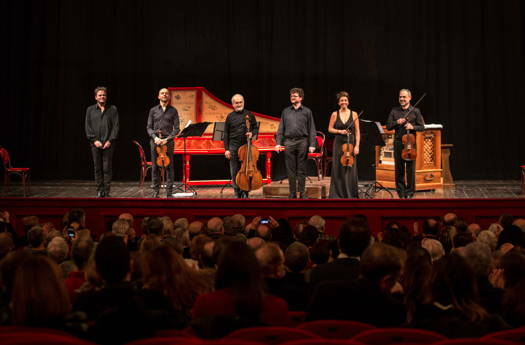 In addition to Dantone himself at the harpsichord, the ensemble included Alessandro Tampieri and Ana Liz Ojeda (violins), Diego Mecca (viola), Mauro Valli (cello) and Stefano Demicheli (organ). A comparison with the previously mentioned Menno Van Delft recording shows that the Accademia Bizantina ensemble provides more tints, emotions and pleasures in the velvet lace of the quite strict and rather austere baroque of J S Bach's last few years. It also shows that the composition, innovative and, indeed, experimental for Bach's times, is still very contemporary today after two and half centuries. The audience was enthralled, and Dantone and his team encored one of the fugues.